PodTrans Pro specializes in transferring a variety of files from iPod shuffle, iPod mini, iPod nano, iPod classic, and iPod touch. It allows you to transfer almost all iPod media files and personal files to PC/Mac and vice versa. 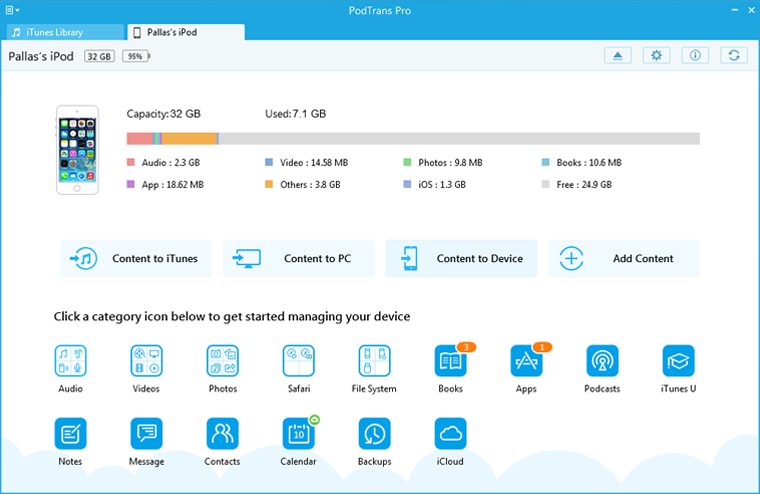 With PodTrans Pro, you can transfer files to your iPod without erasing the existed data and brings you a simple way to manage your iPod content. 1. It supports to transfer media files to & from computer, iTunes library, iPod devices without erasing existed files. 2. Get messages, notes, voicemails, contacts, Safari bookmarks, photos, videos, music, apps and anything used in daily life from iPod devices to computer. 3. Browse, exploit and extract iTunes backup to find the files without performing a restore. 4. It enables you to fresh, browse, add and delete the media files on your iPod device.